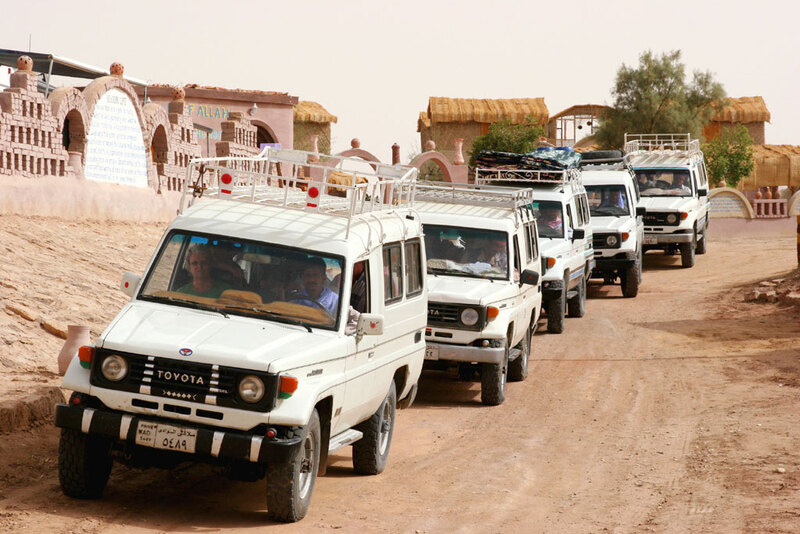 We want to thank the Japanese people, who built these strong cars to make us go deeper and faster in the desert. The cars can carry a lot and heavy goods and drive easily in the sand. They can jump like a fox in the sand. With jeeps you can make lots of kilometer in a short time. You see more of the desert, have more adventure and excitement. It offers more comfort and allows to take more equipment to the desert. We have 8 jeeps and two pick ups, all 4x4 Toyota Landcruisers. From our place you can rent a jeep to go with our driver for one day or several weeks to the places you choose by yourself. 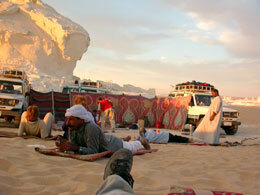 We can pick you up from Luxor or Kairo and drive with you through the Western Desert. We offer you full equipment for the desert trips like tents, windbreaks, blankets or matress, cooking equipment, food and a cook. Round Trip Dakhla Oases with ancient city El Qasr, hot and cold springs, sanddunes, Magic Spring and Roman Temples. To White Desert with its famous white limestone. To Um el Dabadib near Kharga with its Roman Temple surrounded by palm trees in the middle of the desert. To Abu Simble with its ancient pharaonic town at the great Nasser Lake. To the Great Sandsea with pure sanddunes as far as you can see. To Siwa at the border to Lybia, the oasis with the most date palm trees of all the Western Oases.